Fiona Jayde has done it again! The premiere of the Know Thine Enemy cover! The book will be made available October 24. As I've mentioned before, I've worked for over two years on this book, so I am more than a little nervous regarding its release...but I am extraordinarily pleased with the way it's been pieced together, and even though it's a bit different than my other work, hopefully readers will enjoy it. The second Ryker spots the girl with midnight hair, he knows there’s more to her than meets the eye. 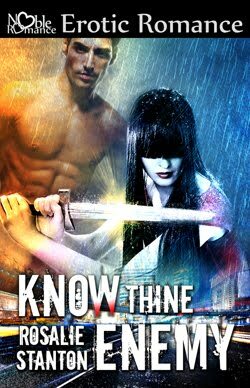 She boasts the title of vampire hunter, but something’s off, something’s missing, and that something pulls him close…until backing off isn’t an option. For years, Izzie has lived for the night, outrunning ghosts from home that seem to find her wherever she lands. Alongside her friend and mentor, who rescued her when she was at her lowest, she destroys creatures she once thought couldn’t exist. But Izzie doesn’t have what she needs to be her best, and doesn’t know if she ever will...or if the life she has is the one she wants. When a shadow from Ryker’s former life surfaces to collect a forgotten debt, vampire and hunter are thrust together in a strange world of eroticism and servitude. They must trust each other if they mean to escape, but when trust turns into something more, the real enemy becomes harder and harder to pick out.